Providing you the best range of motorized pad printing machine, manual pad printing machine, automatic pad printing machine, online pad printing machine, manual pad printer and automatic capping pad printer with effective & timely delivery. 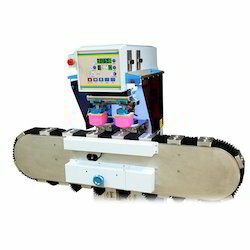 Manual Pad Printing Machine. Model MPP- 50 R - With an aim to fulfill varied requirements of our valued clients, we are engaged in offering Manual Pad Printing Machine. The offered machine can be used to print the ex-factory date, batch number, bar code, issues and other details. Further, the machine gives the flexibility to print on the products, cans, beverage, cosmetics, electric apparatus, and pharmacy, planes on metal, plastics, glass ceramics, films, and nylon. At our manufacturing unit, our engineers have designed the machine adhering to international industry standards and using heavy cast material. 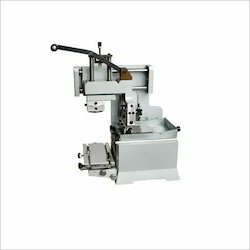 Besides, clients can get the machine from us at industry leading prices. We are counted amongst the recognized organization offering of premium quality Automatic Pad Printing Machine. The offered machine is largely used in various electrical and high power installations. This machine is manufactured using quality stainless steel materials and approved technology. At our manufacturing unit, engineers can develop the machine according to the specifications provided by the clients. Manufactured adhering to industry standards, this machine is made available in various lengths and diameter at reasonable prices. Our firm has gained continuous appreciation as the prime organization offering of Online Pad Printing Machine. The offered machine is controlled by microprocessor that makes an easy operation and offers a stable running and accurate deliveries. It has built-in 4-digit auto counter. Further, the machine is manufactured using cast aluminum frame and approved components. Also, low weight and high intensity, and turn-able head make the machine equipped to deliver optimum performance. Manual Pad Printer =This series of printer is suited to print notes and signs like manufacture date, lot number and single designs on various kinds of bottle, jug, cup or box based on every types of materials, with fast printing speed, cute and clear letter form. PZD-II Environmental protection type series automatic pad printer machine is a high efficiency product excogitated by our company for printing on bottle cap in the drink industry mainly. Easy operation and sanitation are the main features of the machine as automatic feeding in, processing and feeding out to the material to avoid the pollution directly with the hand and guarantee food health. And also the adopted ink-cup prevents leakage and dryness. A person can operate several machines to enhance the working efficiency to save the manpower.